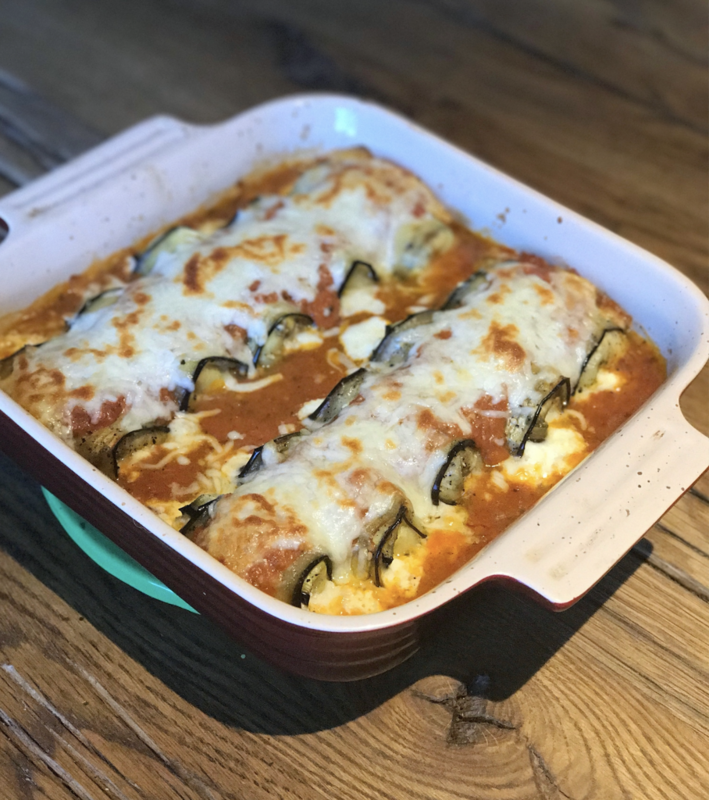 Eggplant Rollatini…Gluten Free and Meat Free Meal! Get a medium dutch oven and place over medium heat. Place olive oil into the pan. While your olive oil is heating up; dice your onion, garlic, basil, and crush your whole tomatoes. ***TIP: When you crush your whole tomatoes remove the tomato stem. Also, save the sauce from the can because that will go into your sauté pan later. Now that your oil is hot, add your onions and a pinch of salt. Sauté your onions until they are tender and slightly translucent. Add your basil and garlic to the onions; cook that for about 15 minutes. Continue to stir the garlic, otherwise it will burn if left alone in the pan. After 15 minutes add the red pepper flake and herb de provence; cook for an additional 5 minutes. Finally add your crushed tomatoes and tomato sauce to the onion mixture. Add a heavy pinch of salt to the tomato sauce. Bring everything to a boil and then reduce the heat to medium low. Simmer your red sauce for about 1 hour or reduce by half. After you have reduced your sauce give it a taste. If you feel like it is too acidic, this is when you add the sugar. I almost always add a little bit of sugar to help balance out the flavors. Also, for this dish I place the cooled sauce in a food processor and pulse it a couple times. This will break up the sauce into a smoother consistency and less rustic. ***TIP: Think ahead for the week. Make the red sauce on a Sunday afternoon. It refrigerates great and can easily be added to pasta, or used to create a meatball sub for another meal! Preheat your oven to 450 degrees F. Line a baking sheet with parchment paper or a silicone mat. Wash your eggplant and cut the tops off. Set your mandolin to one of the thinest settings. 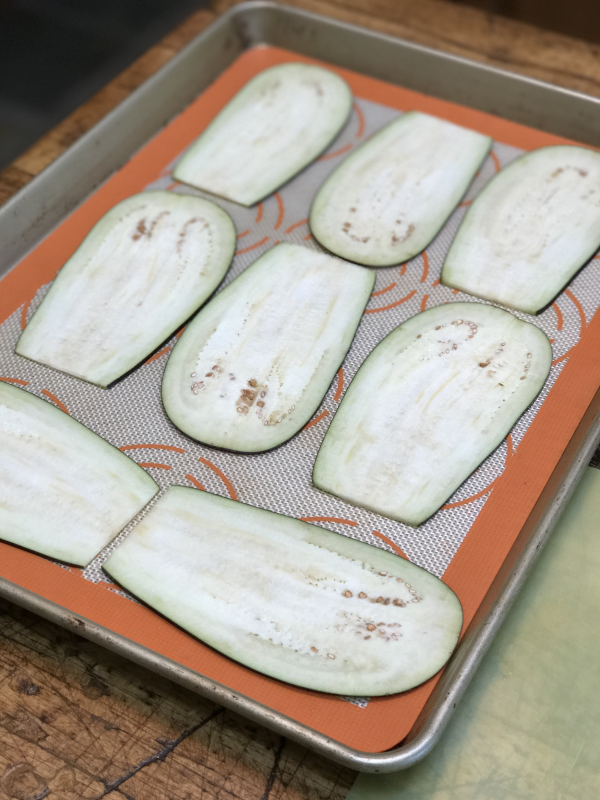 Start slicing your eggplant. ***TIP: Use the mandolin guard because nobody needs to slice a finger off! To a bowl add ricotta cheese, mozzarella, fontina, parmesan, egg, lemon juice, and salt and pepper. Stir everything to combine. Pre heat your oven to 400 degrees F. Find a 9x9 or 9x13 baking dish and add about 1-2 cups of red sauce to the bottom of the baking dish. 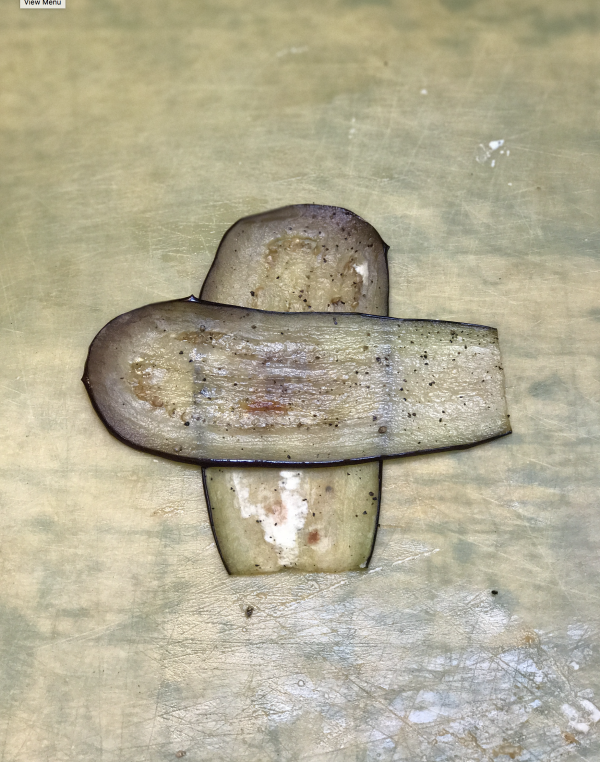 Take two slices of egg plant, lay one vertical and another horizontally over the vertical slice. This will create a cross shape and also help hold in the filling when rolled. 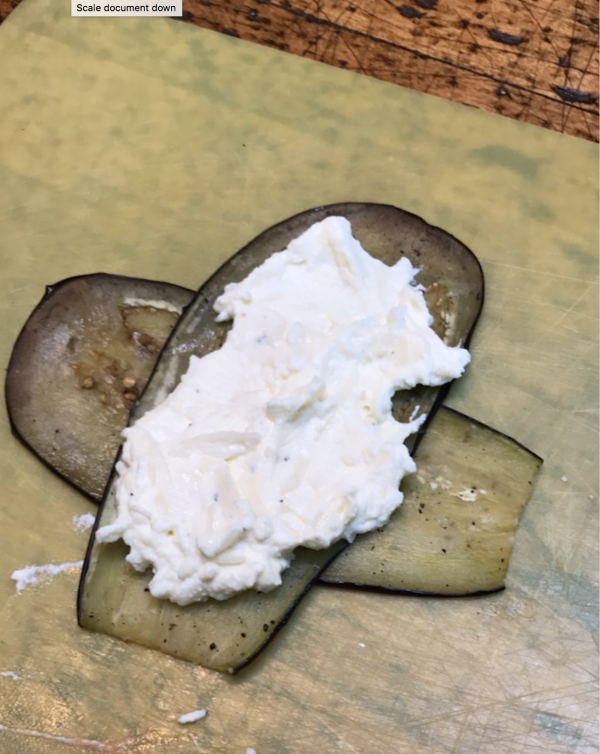 Add about 1-2 T of filling onto the eggplant. Smear the filling so it is a thin layer. 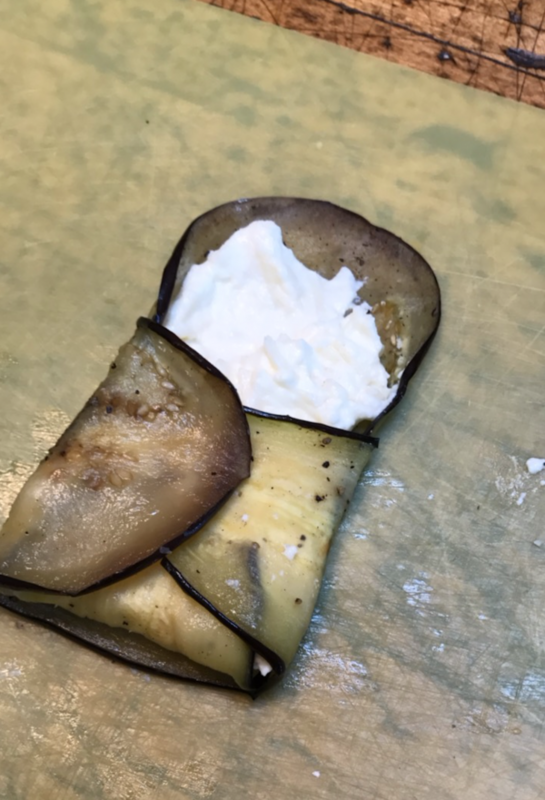 Place the rolled eggplant seam side down so you don't lose and of the filling. Continue to roll the eggplants until your baking dish is full. 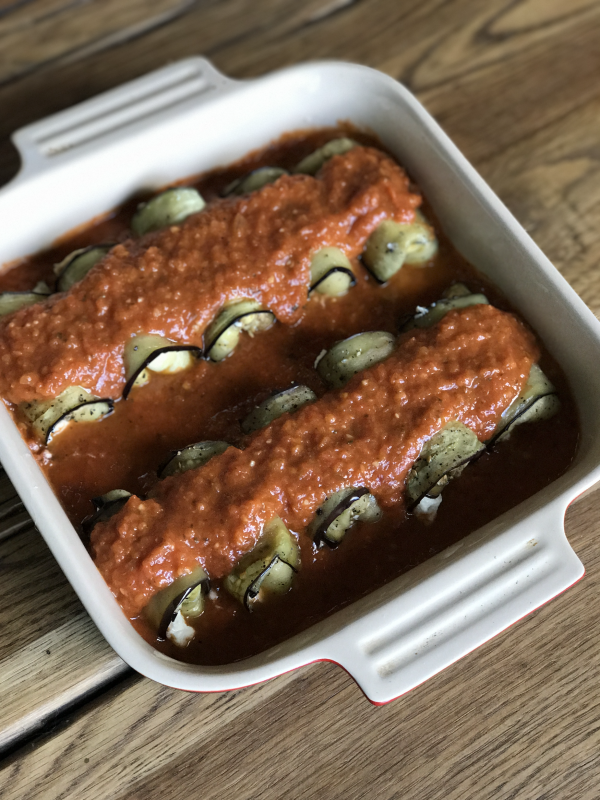 Top the rolled eggplants with red sauce. Also, sprinkle the tops with mozzarella and a little parmesan cheese. Place into the oven and cook until the centers are warm and the cheese has melted; about 20 minutes. Enjoy!! !